Note: Last fall I attended the Collegeville Institute's "Writing Spirit, Writing Faith" workshop with Mary Potter. Before we arrived at the workshop Mary instructed each of us to prepare a 1-page "self portrait" to share with the group, to introduce ourselves. This was mine. “Yeah,” I told Mackenzie, “I am my own party.” It became a running joke between us, but it comes to mind often as I travel or even when I go places by myself in Durham, where I live. I used to avoid going anywhere without “armor” -- a magazine or something to occupy me if I ended up stuck by myself in a restaurant. But a couple weeks ago I sat at the bar at my favorite brewery on Friday evening, no armor, waiting for my friend Ruthan for nearly an hour while she sent apologetic texts about waiting for a pie to finish baking. I was almost done with my first beer by the time she arrived, but I didn’t really mind, especially since she brought me a piece of the pie. After a long week I enjoyed the time alone with my thoughts. Besides, as Ruthan likes to remind me, if the bartender knows your name it’s not drinking alone. It felt good to sit there, by myself. I don’t ever want to choose not to do something I really want to do simply because I might have to do it alone. 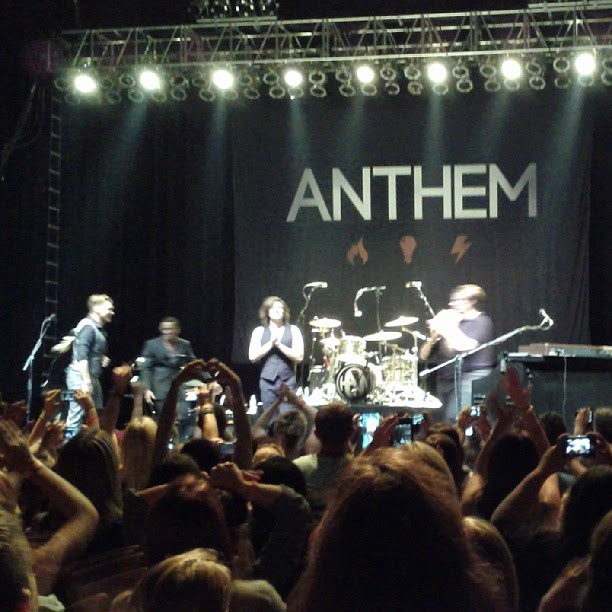 One of my favorite bands played a show in Richmond, VA recently and no one would go with me because, well, it was Hanson -- the blonde heartthrobs of the 90s hit “Mmmbop,” though they’ve made a lot of music since then, most of which I own. I wasn’t about to let some teasing or the lack of company stop me from seeing the band I have followed for fifteen years, in whose songs I can trace my life from junior high to the present. So I bought a bus ticket, found a room on AirBnB, and took a mid-week 24 hour vacation. I danced my heart out. I sang along. I regret nothing. It feels like a peculiar, small act of feminist rebellion, proclaiming I have a right to sit at a bar alone or take myself out for dinner and concert. Not to mention that I love music that hardly anyone else of my generation would be caught dead listening to, unless they’re being ironic. A party of one is small, but it is still a party.